Steroids are currently the only available treatment to reduce the repetitive cycles of inflammation and disease progression associated with functional deterioration in patients with muscular dystrophy (MD). A study reported in The American Journal of Pathology showed that a new treatment approach using the selective estrogen receptor modulators (SERMs) tamoxifen and raloxifene significantly improved cardiac, respiratory, and skeletal muscle functions and increased bone density in both male and female mice with the same gene defects as a subset of patients with MD. “Our results show that there are two important advantages of tamoxifen and raloxifene treatment over steroids, which have limited benefits for patients with MD. First, the SERMs improve both histology and function of all muscles; although steroids improve histology, they improve function to a much lesser extent. Second, SERMs enhance bone density, whereas steroids exacerbate osteoporosis and increase the risk for fractures,” explained Qi Long Lu, MD, PhD, director of the McColl-Lockwood Laboratory for Muscular Dystrophy Research, Neuromuscular/ALS Center, Department of Neurology, Atrium Health’s (formerly Carolinas HealthCare System’s) Carolinas Medical Center, Charlotte, North Carolina, USA. Other benefits were also observed. Control mice showed progressive muscle degeneration and regeneration in the diaphragm, accompanied by increasing fibrosis and infiltration, as well as significant impairment in respiration. Both tamoxifen and raloxifene eliminated focal infiltration and reduced the extent of fibrosis in the diaphragm, increased mass, and improved breathing ability. “Both treatments also improved bone density in the tibia and femur, potentially reducing the risk of fracture, a major threat to patients as MD progresses,” added co-author Bo Wu, PhD, a research scientist at the McColl-Lockwood Laboratory for Muscular Dystrophy Research, Neuromuscular/ALS Center, Department of Neurology, Atrium Health’s (formerly Carolinas HealthCare System’s) Carolinas Medical Center. 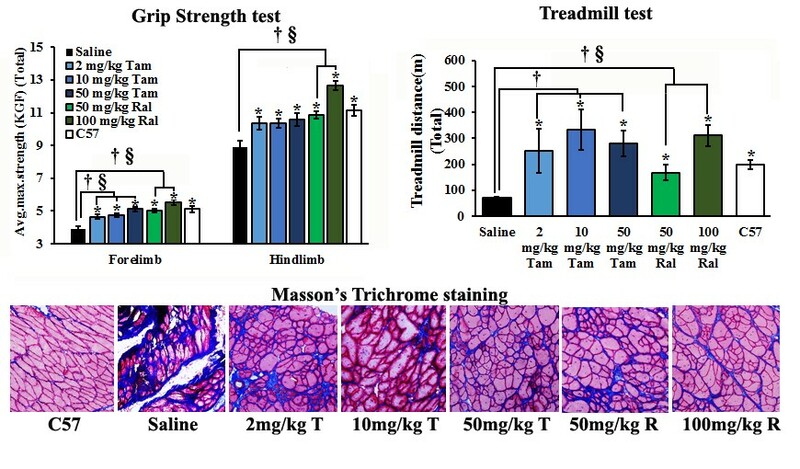 Effect of one year of tamoxifen and raloxifene treatment on muscle function (by grip strength and treadmill exercise) and fibrosis by Masson’s trichrome staining of tibialis anterior muscle (Tan and T, Tamoxifen; Ral and R, Raloxifene). “SERM therapy has great potential to significantly delay or halt MD progression. With the vast amount of safety data available, the selective use of tamoxifen and raloxifene in male and female patients with MD is an attractive and realistic alternative to steroids,” noted Dr. Lu. This together with the detailed analyses of potential side effects and benefits in male and female populations provide rationale for early clinical trials. Importantly, the beneficial effects of SERMs are expected to extend to other forms of MD, beyond the specific mouse model investigated here. The article is “Long-Term Treatment of Tamoxifen and Raloxifene Alleviates Dystrophic Phenotype and Enhances Muscle Functions of FKRP Dystroglycanopathy,” by Bo Wu, Sapana N. Shah, Peijuan Lu, Lauren E. Bollinger, Anthony Blaeser, Susan Sparks, Amy D. Harper, and Qi Long Lu (https://doi.org/10.1016/j.ajpath.2017.12.011). It will appear in The American Journal of Pathology, volume 188, issue 4 (April 2018) published by Elsevier. Full text of this study is available to credentialed journalists upon request; contact Eileen Leahy at +1 732 238 3628 or ajpmedia@elsevier.com. Journalists wishing to interview the authors should contact Savannah Simons, Clinical Public Relations, Corporate Communications, Marketing & Outreach, Atrium Health, at +1 704 631 0931, +1 434 872 3511 (mobile), or Savannah.Simons@carolinashealthcare.org. This research was supported by the Carolinas Muscular Dystrophy Research Endowment at the Carolinas HealthCare Foundation.